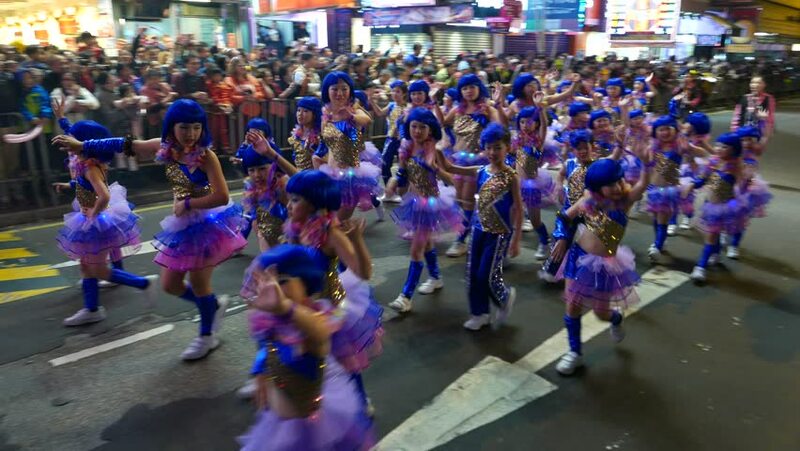 HONG KONG - FEBRUARY 19, 2015: Small Chinese children in skirt on parade procession, night street. Chinese New Year celebration. Group of children walk, tired of dancing during long parade. hd00:09MOSCOW, RUSSIA - DECEMBER 24, 2015: Children dance around the Christmas tree. New Year performance of "The Nutcracker and Mouse King" Christmas ballet show inside ZIL Culture Centre. hd00:14LJUBLJANA, SLOVENIA - AUGUST 2016: Fast motion static long shot of shallow focus on people passing by with huge crowd in background. 4k00:14LJUBLJANA, SLOVENIA - AUGUST 2016: Fast motion static long shot of shallow focus on people passing by with huge crowd in background. 4k00:08PENANG, MALAYSIA - MARCH 10, 2018: Crowds splash water toward kids during yosakoi festival at Penang. 4k00:10PENANG, MALAYSIA - MARCH 10, 2018: Different ethnic of races at Penang enjoy Japanese cultural during yosakoi parade.